I don’t like the antibacterial waterless soap. It stinks. It dries out my hands. And I’m not sure that the antibiotic and alcohol that is the basis for the antibacterial claims is all that effective. But we need something in the car to wipe our hands, after we use an outhouse on the road, or walk into the grocery store. Hearing all the hacking coughs in the store makes me want to wipe the cart handle really well. Often the store has water-less alcohol-based handwash gel but no tissues. In fact, I haven’t seen a single tissue in that hand wash station in months. That doesn’t do much good, does it? The last time I needed a tissue at the handwash station was last Friday. I was stocking up on wild sockeye salmon at $1.25/100 grams. I picked up 12 whole salmon for our winter supply. The salmon comes in plastic bags, and the bags wreak of fish slime. The fishy smell clings to your hands and gets on everything you touch, after you’ve handled the fishy bags. You can imagine my revulsion, when I went to the handwash station and the tissue dispenser was empty. Again. I was so glad that I had these handy homemade herbal antibacterial wipes in the car to get the fish fluids off my hands, before the long, hot trip home. Did I mention it was over 100F outside? And our car doesn’t have air conditioning. But these fabulous herbal antibacterial wipes vanquished the smell and the clinging stickiness, easily. I never thought about it again. I used to make these wipes 30 years ago when my first baby was in cloth diapers. Those were the days of kite fold rectangular diapers. But I’ll save that for another post. I used this recipe for a diaper wipe. And followed up with a sprinkle of tapioca starch, to soothe the damp areas, in his tender fold. If you decide to make this recipe for diaper wipes, replace 1/2 the liquid with aloe gel and use only the lavender essential oil. Omit the others. Take the paper towels and cut each paper towel in quarters, separating the towels on the perforation. Take the towels and roll each one up in a single roll, being sure that the new towel is added under the flap of the one that went before it. n this way, as you remove a towel from the roll, another towel will come up to take it’s place, like the way a tissue box works. 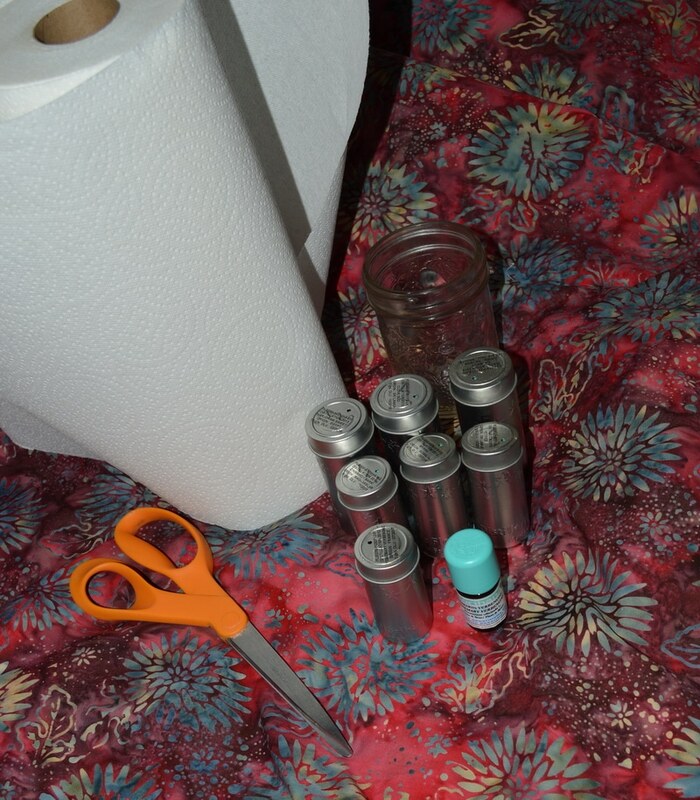 Keep cutting paper towels in to quarters and rolling them in this way, until your roll of paper towels fits snugly into your jar. Roll all the towels up in a single roll, adding each one under the flap of the one before it. In a separate cup measure the thieves vinegar (or vodka), and the essential oils. Drizzle the vinegar mixture over the top of the paper towels inside the jar. Put on the lip and shake the jar. Allow to sit undisturbed for at least 15 minutes. The dry paper towels will wick up the excess moisture. You can leave any extra liquid in the jar or pour it off when all the paper towels are uniformly damp. To use, remove the outermost paper towel from the bundle in the jar. This will bring the next wipe to the top of the jar for the next person to use. Keep the jar capped tightly when not in use. 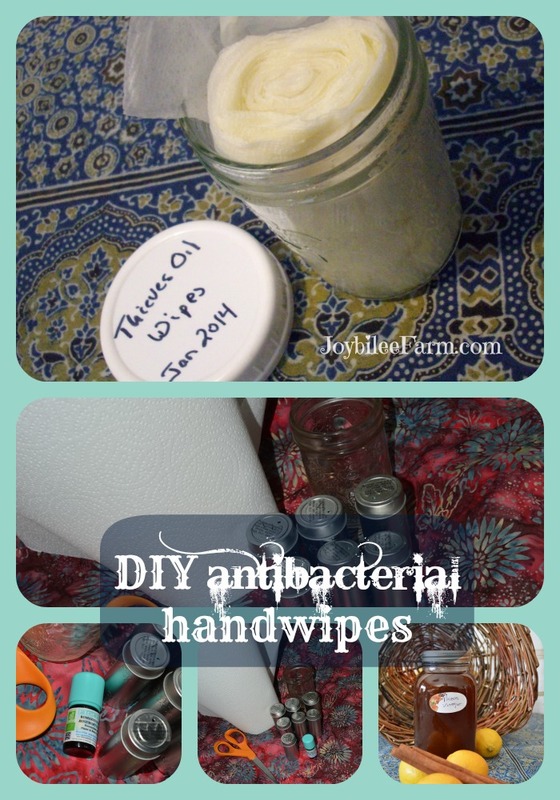 I keep a jar of antibacterial wipes in the Herbal First Aid Kit, and a jar in each vehicle. It’s come in handy several times, especially in winter when there are so many colds and flu going around. My favorite place to buy smaller bottles of organic, steam distilled, essential oils is Tropical Traditions. In fact, I love Tropical Traditions for organic, nonGMO, soy-free baking supplies, coconut oil, toiletries, as well as their complete line of organic, essential oils. Their service is fast and inexpensive, and the quality of the essential oils is first class. 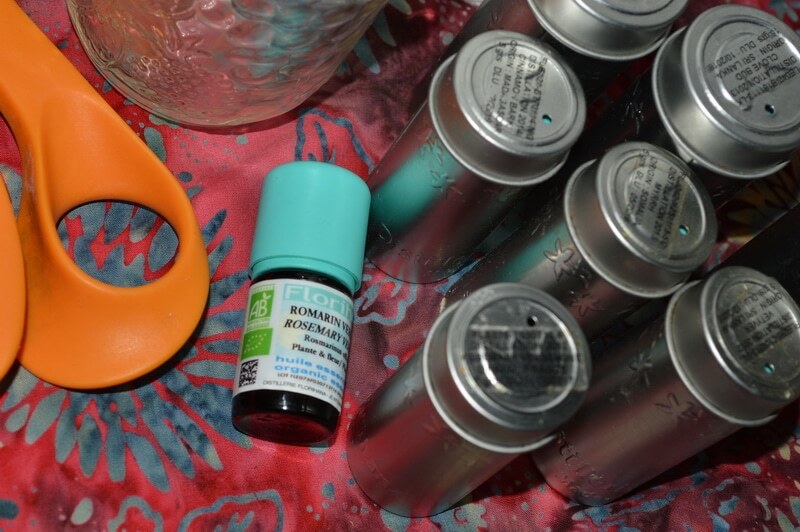 Each bottle of essential oil comes in a classy reusable tin so that the oils won’t leak into your purse. I bought several different essential oils just so that I could refill the bottles and carry them in my purse, and my travel first aid kit without worrying about them leaking. PS. In reliving that fish buying experience I am reminded that I have never seen a grocery store cleaning or sterilizing the carts — whoever used my cart after me would have put their fresh fruit right on top of the fishy bacteria in the cart. Yuk. Remind me to bag my fruits and vegetable in the icky plastic bags from now on. I’ll need to find a better way to omit the plastic than just not using it. If you have a suggestion I’d love to hear it. would the wipes need to be in a glass jar? No they could be in a plastic container. You will have some leaching of the plastic with the heat of the car and the acid though. Glass containers are nonreactive. I would like to join here so I can be able to learn more about the herbs and things thanks. I have tried to log in to see what books you have but it says it doesn’t recognize my password. I was wanting to download the ebook on the side of the page. Hi, Jan, The log in is for paid members only. The books on the side bar are not part of the membership site though. If you click on the book it will take you to either the sales page or the free offer for each individual book ad. 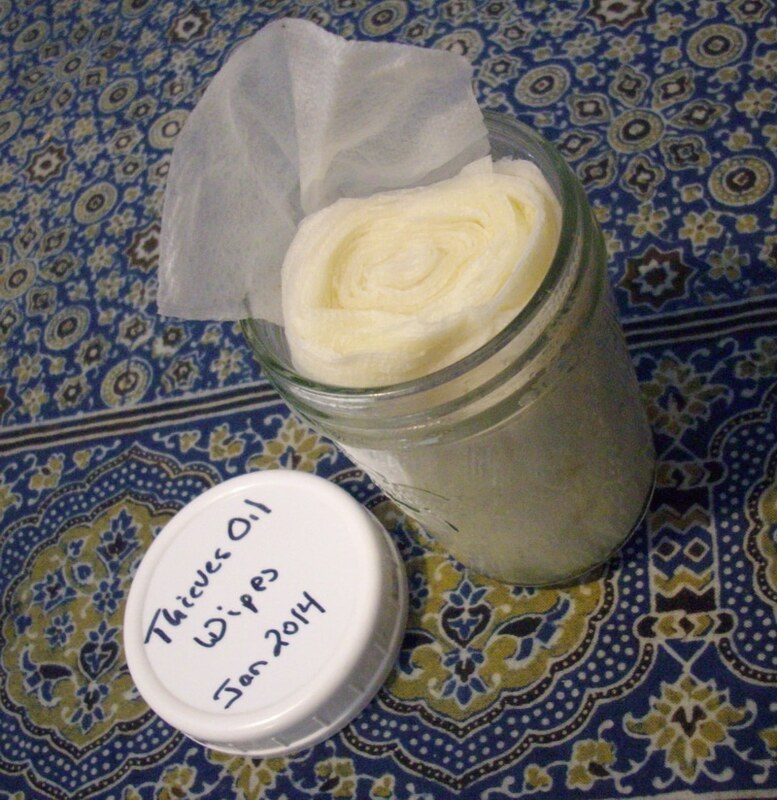 Great post, thank you so much for sharing this recipe and your source of essential oils. I am just starting my journey with essential oils and there are so many places to buy them that I got totally confused and overwhelmed. Going to make this for the family. Thanks. I also buy essential oils wholesale for soap making and when I make large batches of herbal cleaning supplies or herbal remedies. But for when I only need a few drops of an oil, I love TT essential oils. Good quality and not as expensive as the multilevel marketing essential oils.